The Westin Las Vegas isn’t a Vegas super hotel. It doesn’t have a nightclub with an Ibiza guest DJ, it isn’t located right in the center of the strip, and there aren’t wild pool parties on the weekend (though the pool is open 24 hours). So why would I stay at the Westin and why should any of you? The answer is because it is an SPG property that provides all the familiarities of home. With platinum SPG status you get free Wi-Fi (without having to pay the outrageous Resort Fee of $35+ charged by most Vegas hotels), 4PM late checkout (a lifesaver for a Vegas weekend), and the Westin heavenly bed. SPG Platinums can opt for free breakfast which in Vegas is a great late night snack. In addition, the service, the quality of the room, the amenities are on par with Westins worldwide. Finally, the room rate is reasonable all things considered. But, as was the problem with Early’s Apartment, the Westin isn’t in the heart of the action as it is not located directly on the Strip (though it is only a block away). Still, the Westin is a great spot to start your stay in Vegas (if you are looking to relax before commencement of the festivities) and a great place to end your stay (if you are looking to decompress and detox before heading home). 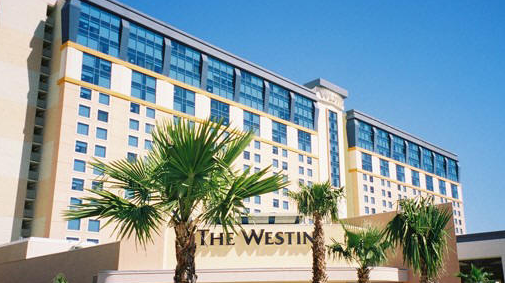 In the end, it’s a Westin. That alone says enough.